Did you know that the image of witches flying on broomsticks comes from a psychedelic folk practice from the middle ages? Unfortunately, we have lost all documentation from the folk herbalists using this type of divinatory medicine during that time period. The only written accounts we have are survived in court records of witch trials where one of the main ingredients of witches flying ointments was said to be the fat of Christian children… sigh. In this week’s class we will talk about how we can recover and reclaim this ancient practice - free from false dogma! We will also discuss the lore surrounding foxglove and monkshood - two very deadly poisons whose extracted alkaloids are used in some of our modern Western medicines. If you are local to Brooklyn you can drop into this class this Thursday at @animamundiherbals, otherwise I am teaching it online on March 3rd and March 24th. Trying to up my intake of nutrient rich plants via herb-infused ghee. Nettle and burdock infused on the right and reishi, turkey tail, dandelion, and astragalus infused on the left. How is this plant, called “the most prompt of all poisons” by Pliny the Elder, perfectly legal yet things as medicinally, psychologically, and spiritually beneficial as cannabis, psilocybin mushrooms, and ayahuasca illegal? Unfortunately, I think we all know the answer to that. If aconite were safely ingestible and consciousness awakening it would be promptly outlawed. Plant can kill - no problem. Plant can cause you to question reality - it’s a danger to society and must be stopped at all costs. This is not to say that aconite is not a magical plant with the power to shift our consciousness. We can do a lot of deep inner work on the plant spirit level but we have to know how to support that work in ourselves. Learning how to journey inwards without the use of consciousness shifting plants is a skill I hope that everyone has the privilege to learn in their lifetime. Trying to learn the best way *for me* to work with this ally. The spirit of fly agaric is strong and my normal course of action would be to just work with it on a plant spirit level. But from the first time this mushroom appeared in my dreams it seemed to be encouraging me to ingest. 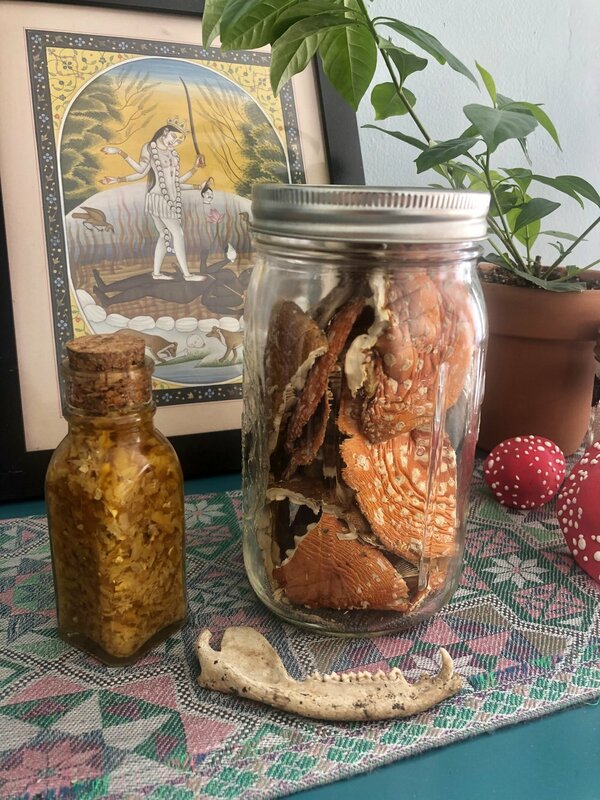 Last week I had an ancestral healing session with @adrienne_sloan where I met an ancestor who showed me images of Amanita tea and asked for offerings of it. I never thought Amanita would be a central ally for me, but here we are. Today is the last day to sign up for the Poisonous Plant Medicine series. The next time I offer this course, I will be raising prices for it. Tomorrow we will be learning about plant spirit communication and poison as medicine - the foundations for my work with poisonous plants! You can drop into each class individually or take the whole 6-week course. Week 6 is when we will learn from Amanita Muscaria.